This module describes a naturalistic behavior intervention model called pivotal response treatment (PRT) and takes you through a series of implementation steps for each of the four pivotal learning areas: child motivation, responding to multiple cues/stimuli, child initiations, and self-regulation. PRT has primarily been researched and developed by Drs. Robert and Lynn Koegel at the University of California, Santa Barbara and Dr. Laura Schreibman at the University of California, San Diego. See the module references and resources section for a more complete list of contributors. what are the learning goals for this module? Why use Pivotal Response Treatment? Where Can You Use Pivotal Response Treatment? What is the Evidence-base for Pivotal Response Treatment? Pivotal Response Treatment (PRT) is a naturalistic intervention based on the principles and practices of applied behavior analysis (ABA) and developmental approaches. PRT shares many instructional practices found in other well-researched, naturalistic behavior interventions, such as incidental teaching, enhanced milieu teaching, and naturalistic aspects of applied verbal behavior therapy (Allen & Cowan, 2008). PRT focuses on improving children’s motivation during learning and socialization (Koegel et al., 2006). PRT improves core behaviors, such as social communication, and is ideal for use with toddlers with ASD. PRT is also a child and family-centered intervention and capitalizes on child interests and initiations in everyday environments and within daily routines. It is particularly helpful for improving communication, language, play, and social behaviors. Motivation may be the central pivotal area. Creating motivational PRT opportunities provides the foundation for implementing the other pivotal areas, as well as improving specific meaningful goals and objectives. Improving motivation is a central principle of PRT and is the foundational procedure for the other pivotal areas (Koegel & Koegel, 2012). PRT learning opportunities are specifically designed to increase child motivation to learn and interact. 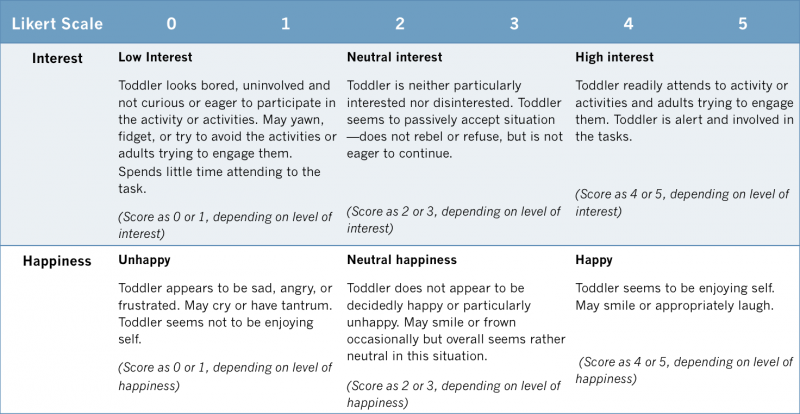 In PRT, motivation can be defined as a high degree of child responding and initiating within social and learning environments, in the presence of positive child affect (i.e., happiness, interest/enthusiasm, and pro-social behavior; see Table 1 for a Likert scale). PRT may increase a toddler’s desire to perform (and try to perform) skills and behaviors by using specific antecedents (events that happen before a behavior) and consequences (events that happen after a behavior) within PRT learning interactions. For instance, PRT builds on a toddler’s interests and choices, reinforces attempts through immediate and contingent contact with natural reinforcers, and avoids “drilling” by varying tasks and interspersing maintenance and acquisition tasks. Teaching toddlers to initiate learning is pivotal in that it “opens the door” to additional learning and social interaction. Teaching toddlers to self-initiate is in contrast to learning opportunities that are most often adult-initiated (e.g., the child’s response only occurs when specific discriminative stimuli – specific learned cues or instructions – are presented by an adult). Initiations have been taught in the forms and functions of: question asking (e.g., What’s that? ), obtaining attention and socially commenting (e.g.,“Look!”), and asking for assistance (e.g., “Help!”). Carefully fading prompts and using time delays across teaching targets and opportunities, by waiting a few seconds for the child to initiate without prompts, enhances child-initiated behaviors. Children with ASD are often good at focusing on a specific detail or aspect of a stimulus, but they may not simultaneously attend to multiple cues present in the environment. This is sometimes called, over-selectivity. Further, children may attend to less relevant cues. Focusing on teaching toddlers to respond to relevant and multiple cues is suspected to produce widespread effects in the child’s ability to learn from his/her complex environment (Koegel & Koegel, 1995). * Targeting multiple cues may only be developmentally appropriate for older toddlers and beyond. Self-regulation as Pivotal. Self-management* for toddlers with autism looks different than self-management for older children, adolescents, and adults. For older children, self-management is sometimes defined as teaching children to self-monitor, self-evaluate and discriminate their own behaviors, and finally self-reinforce. Self-management strategies may lead to improved generalization of skills, as well as improved self-regulation, such as increased independence (i.e., less dependent on prompts by adults) and decreased challenging behavior. * Targeting self-regulation/self-management through typical self-management teaching procedures may not be developmentally appropriate for toddlers. Improving self-regulation of behaviors for toddlers, however, is important and certain steps can be provided to young children in order to establish a foundation for self-regulation and self-management later in development. Teaching language and communication are early developing foundations of self-management, in that language can be used as a mediator to teach and use self-management when the child is older. Further, appropriate communication can functionally replace difficult behavior. Use naturalistic teaching to improve developmentally appropriate skills. Skills or behaviors selected are developmentally appropriate and individualized, and developed in collaboration with parents and team members. What specific behaviors or skills are targeted in PRT for infants and toddlers? For more information related to naturalistic teaching, see the Naturalistic Intervention learning module and Allen and Cowan’s (2008) chapter on naturalistic teaching procedures. Target pivotal areas, particularly the toddler’s motivation to learn and engage. Pivotal areas are suspected, through research, to produce a wider range of changes (e.g., collateral effects) compared to teaching many skills in isolation, one right after another. Also referred to as pivotal responses, pivotal behaviors, and/or behavioral cusps, pivotal areas cause a “ripple effect,” whereby a direct improvement in a pivotal area can lead to indirect improvements in many other skills. Learning and interaction should be fun! These improvements help make PRT an acceptable and feasible intervention for parents and practitioners to implement. By implementing PRT motivational components, toddlers are learning and they are enjoying social interaction and intervention more often. Likewise, active parent involvement in interventions improves parent affect and confidence, and decreases parent stress (Brookman-Frazee, 2004). Positive affect is “contagious” in that happy and engaged toddlers can lead to happy and engaged parents, which in turn increases and maintains the toddler’s positive affect, and so on. It is important that sessions are conducted in a way that is fun and interactive for both toddlers and parents. PRT motivational components contribute to improving child and parent affect. Educating and coaching parents is interactive in PRT, and involves a combination of didactic instruction, modeling by the clinician, practice by the parents, and immediate “live” feedback from the parent educator. This means that, during parent education sessions, both parents and practitioners are working together in a collaborative manner with a toddler. Variations of this PRT parent education model exist (Steiner, Koegel, Keogel, & Ence, 2012). For instance, group parent training formats and self-directed DVD parent training programs in PRT can also be used successfully. However, it is essential that parents and practitioners actively practice the techniques while receiving on-going feedback. Emphasizing collaboration and parent empowerment, PRT parent education sessions incorporate parental expertise in setting up their toddler’s program (e.g., planning the toddler’s goals/objectives) as well as implementing the intervention. For example, parents help to pick out toys or what words to teach to the toddler during play. Many parents can obtain a high degree of confidence, reduced stress, and high levels of treatment fidelity (i.e., they can implement PRT well) through this approach. This parent education model is a cornerstone to PRT, but can apply to various natural change agents, including early childhood educators, practitioners, respite workers, siblings, and relatives. Where Can PRT Be Used and By Whom? As a naturalistic intervention, parents and practitioners apply PRT in everyday settings, throughout the toddler’s day, during daily routines, and play. PRT has been evaluated in home, clinic, and community settings, with a variety of natural change agents. Teaching in varied everyday environments, by natural intervention agents such as parents, has been demonstrated to promote generalization and maintenance of skills. Emphasis on rapid generalization is an important facet of PRT. What Is the Evidence-base for PRT? The National Professional Development Center on Autism Spectrum Disorder (NPDC on ASD) initially reviewed the research literature on evidence-based, focused intervention practices in 2008. A second, more comprehensive review was completed by NPDC in 2013. A total of 27 EBPs are identified in the current review. Of the 27 practices, 10 practices that met criteria had participants in the infant and toddler age group, thus showing effectiveness of the practice with infants and toddlers with ASD. The practices were identified as evidence-based when at least two high quality group design studies, five single case design, or a combination of one group design and three single case designed studies showed that the practice was effective. The full report is available on the NPDC on ASD website. PRT meets evidence-based criteria with 1 group design and 7 single-case design studies. For the infant and toddler age group,one group design study included toddlers with autism and demonstrated positive outcomes in training parents in the use of PRT (Nefdt, et al., 2010). PRT can be used effectively to address soail, communication, joinrt attention, and play skills. A complete list of the research evidence-base literature for children aged birth to five is included in the Module Resources section. Studies have been conducted for individual components of PRT, for the entire multi-component intervention, in multiple contexts, and for multiple ages and target behaviors. However, it is important to note that the development of this infant/toddler module extrapolated from PRT studies on slightly older children, as well as clinical expertise and very recent data on PRT for infants and toddlers. See References for a list of relevant studies, chapters, books, and websites. Refer to the PRT Fact Sheet from the updated EBP report for further information on the literature for prompting procedures. What are the four pivotal areas of pivotal response treatment (PRT)? What are some advantages of using PRT? After reviewing this section, you should be able to recognize the basic steps for using this practice. The planning process for PRT involves identifying objectives for the toddler, collecting baseline data, and preparing materials and activities. The first step is to develop goal areas and specific objectives. In developing goals and objectives, take into account the toddler’s needs, strengths or interests, and family preferences, values, and context. In PRT, the identification of child needs is based on the integration of observational data in everyday environments, interviews and collaboration with parents, and assessments. Generally, goals should address core areas of autism and developmentally meaningful behaviors through improving a toddler’s motivation to acquire and engage in the target behaviors. More intensive assessments, such as the Autism Diagnostic Observation Scale (ADOS), could also provide important information on specific target behaviors. Behavioral assessments, such as functional behavior assessments (FBA), provide valuable information regarding the child’s functional communication and challenging behavior. Further, assessments should be strength-based (Cosden, Koegel, Koegel, Greenwell, & Klein, 2006). PRT researchers and clinicians suggest that standardized assessments might reflect performance issues related to motivation, rather than ability levels. Strength-based Planning for Infants and Toddlers provides some examples of the potential for strength-based, naturalistic assessment for toddlers with autism. Always directly observe the infant or toddler and collect baseline data within natural, everyday environments and during child interactions with both parents and practitioners. Semi-structured language and play samples (examples provided below), which collect a variety of information on the child’s communication, language, and behavior during play and daily routines, provide important information necessary to develop the toddler’s PRT program related to communication, socialization, and language. Direct observation and collection of baseline data on meaningful target areas, such as social interaction, joint attention, imitation, play, and interfering behaviors should inform your target goals and objectives. What target skills might be pivotal or which learning areas will have the widest and most immediate impact on the toddler or infant’s overall development? In order to establish pre-intervention levels of a toddler’s motivation to learn and engage in developmentally appropriate behavior, initial and ongoing data collection should be collected by the interventionist to evaluate how responsive the toddler is to the social environment, how often the toddler initiates interactions (and the function of the initiations), and the toddler’s overall affect across contexts. A Likert Scale can be used to monitor the toddler's affect. Included also are examples of possible meaningful goal areas that can be used when developing a PRT program for a toddler or an infant. where and with whom the communicative act occurred? Nonverbal (prelinguistic) communicative behavior can be assessed in conjunction with verbal behavior, or by itself if that is an appropriate mode of communication for the infant or toddler. It is also important to note the duration of your sample. Consider the suggested questions to ask about an infant or toddler's social-communicative behaviors. What data can be collected from the language sample? The percentage of responding to social-communicative stimuli (i.e., responsivity). The percent of the time a toddler attempts to imitate verbal models and various sounds. The percent of spontaneous versus prompted utterances. The overall vocabulary and word diversity (e.g., number of different words used in 20 minutes). The accuracy of choice making, amount of echolalia, and the accuracy of word label-object/action correspondence (i.e., word discrimination). The functions of the verbalizations used (e.g., percent of spontaneous utterances used to comment on events versus to request items). The types of questions the toddler uses. The parent or practitioner can add specific evocations for various question types within the language sample (e.g., hide a needed toy piece in order to evoke a “where?” question). The differences in communication/language used between settings, activities, and communicative partners (e.g., familiar vs. unfamiliar people). The use of communicative nonverbal behaviors in conjunction with verbal behaviors (e.g., percent of utterances used in combination with joint attention behaviors such as pointing and gaze shifting). The length of the utterances (i.e., mean length utterance by words or morphemes). The developmentally appropriate use of various linguistic skills and syntax (e.g., use of verbs, [-ing] endings, plurals). The percent of multiple-word utterances that were spontaneously generated. The ratio of maintenance and acquisition interspersed by a parent or practitioner. The ratio of various antecedents (i.e., cues, discriminative stimuli, prompts, and task variation) used by the parent or practitioner (e.g., percent of time delays used versus model prompts). The sounds (phonemes) being produced by the child (e.g., articulation) and vocal attempts being made (e.g., percent correct terminal [-d] sounds) and the overall intelligibility. PRT targets social communication and language in the context of play, functional engagement in daily routines, and social activities. The development of social communication within PRT relies on the continued development of other developmentally meaningful areas, including expansion of the toddler’s preferences and play skill repertoire, increased attempts at spontaneous imitation of functional actions, and increased social engagement (including joint attention). Use questions to guide the development of play, engagement, and functional imitation objectives. While using PRT, you will monitor challenging behaviors, such as stereotypical behavior and tantrums, but may not initially focus intervention here (unless the behaviors are particularly interfering and dangerous). Instead, the effort is placed on improving motivation during learning opportunities and interaction, and increasing functional communication, so that challenging behavior becomes less relevant to the toddler. As a toddler’s motivation, functional communication, and functional engagement improves during the initial stages of PRT, many challenging behaviors may indirectly decrease. Still, the initial PRT plan should define the challenging behaviors and implement a functional behavior assessment in order to determine the behaviors’ functions, or the purpose they may serve for the toddler. PRT continuously and proactively teaches communication that is functionally equivalent to challenging behavior, thereby helping to prevent further development of challenging behavior. Incorporate the toddler's strengths, interests, as well as family preferences and values, into the development of goals and objectives when planning PRT. It is important to identify areas of need as well as the strengths of the toddler. PRT researchers and clinicians recommend a strength-based, naturalistic approach to assessment and intervention. Strengths should be capitalized on when developing goals, objectives, and intervention plans. EXAMPLE: If a non-verbal toddler sometimes shouts out labels in a favorite TV show, this is where communication or language intervention might begin. Developing the intervention plan should also focus on the contextual fit of the intervention objectives and the family’s needs. Instead of simply requiring a family to adapt to the intervention procedures and goals, make explicit efforts to adapt the intervention to various family contexts. Families differ in many ways, and goal development should attempt to fit into differing family contexts. For instance, if a family has a newborn on the way, the play objectives may change to increasing independent, functional play (or play with an older sibling), instead of increasing turn taking during social games with a parent. Remember to take baseline data on the selected objectives and analyze the data. Typically, 6-10 meaningful objectives are formally targeted at a time (where data are collected), but multiple other goal areas are still addressed and maintained. PRT implementation is not limited to those specific, formal objectives. You may capitalize on incidental learning opportunities that target different behaviors than the ones established in the formal objectives. Taking baseline data will help you verify that the objective is necessary. You also will be able to compare intervention data to the baseline data in order to answer whether the intervention was effective. This, in combination with monitoring fidelity of implementation, allows for data based decision-making. PRT is intended to eventually become a part of the toddler family’s lifestyle. When this occurs, provide opportunities quite naturally, with minimal formal preparation. This is also the case in home and community settings. At first, you may benefit from some explicit planning and preparation. Even as PRT becomes a more natural occurrence throughout the day, continue to engage in some level of planning and preparation, particularly as new objectives and activities are introduced. This inventory help you provide more motivating items and activities during intervention and throughout the day. Make sure to follow the toddler’s lead and provide choices between these preferences in the moment. Although you may expect the toddler to engage in the most preferred activity, in the moment they may choose a different activity. You may be surprised at how many items and activities a toddler enjoys! What are the toddler’s learning strengths and emerging skills? How can the toddler’s individualized PRT program capitalize on them? If the toddler is great at reciting the ABC’s, then this might indicate a strength and learning preference. If you are going to introduce some puzzles during play, ABC puzzles might be a great place to start. It might mean that the toddler learns well from repeated patterns and/or songs. If you initially select to teach functional, spontaneous verbal communication to a toddler, you might start by using carrier phrases within the alphabet or within a song. It is important to consider the toddler’s developmental level when selecting motivating activities and materials. These routines might differ by weekdays versus weekends, winter days versus summer days, etc. Remember to include the mundane! Parents and practitioners often find that the best learning opportunities occur among the basic day-to-day events or items a toddler desires. These might include opening the door to go outside and play, buckling a seat belt to drive to the park, turning on the bath tub water before a bath, and turning a light on and off upon entering and exiting a room. Daily routines may provide excellent times to present motivating learning opportunities, as long as the toddler indicates that he or she wants these things to occur in the moment. objectives and how the toddler’s interests and preferences can be incorporated. After listing the various daily routines and activities, form an activity matrix of what objectives can be targeted during the different times of the day. Consider whether a particular time of the day should be dedicated to more intense intervention sessions with more frequent opportunities provided. Once you have identified what types of interests and preferences the toddler has, and have planned where opportunities can be provided, the next step is to prepare any materials. Can the materials be arranged to gain shared control and establish motivation? For instance, a parent might prepare by putting the different colored ducks up on a shelf, in sight but out of reach in the shower, or put the ducks in a “locked” Tupperware container. Preparing materials is also about preparing to manage the materials. If you are working on accurately requesting colors and the toddler enjoys playing with ducks in the bath, then prepare multiple colored ducks to have out during bath time. A toddler can even help paint them or select them at the store! In summary, you should use an activity matrix to help you plan when opportunities will occur and then prepare your materials and activities. After reviewing instructions above, select a Scenario. Review the Troubleshooting Tips if you are having trouble viewing. Make sure that you have the latest version of Adobe Reader installed on your computer. Download the PDF file and open the file with Adobe Reader. PC instructions: Right-click the link for the Practice Scenario and then select "Save Link As..."
Mac instructions: Press the Command key + the Practice Scenario. Open the downloaded PDF file. Review this help page for how to adjust your browser settings to display PDF. Which of the below is the most complete and accurate sequence of planning PRT for toddlers? Decide on the skills to target based on an established curriculum and standardized assessment protocol, write measurable and observable objectives, collect baseline data, plan when the opportunities will be provided, and prepare any materials. Decide on the skills to target based on direct observation, write measurable and observable objectives, collect baseline data, plan when the opportunities will be provided, and prepare any materials. Decide on the skills to target based on direct observation and collaboration with parents, any assessments that have been completed, developmentally appropriate and meaningful areas (including core ASD characteristics) that are likely to produce immediate a widespread positive changes, strengths and preferences/interests of the toddler, and family preferences/context. This is followed by writing measurable and observable objectives, planning when the opportunities will be provided, and preparing any materials. Decide on the skills to target based on direct observation and collaboration with parents and other practitioners, any assessments that have been completed, developmentally appropriate and meaningful areas (including core ASD characteristics) that may produce immediate a widespread positive changes, strengths and preferences/interests of the toddler, and family preferences/context. This is followed by writing measurable and observable objectives, collecting and analyzing baseline data, planning when the opportunities will be provided (and by whom), and preparing any materials. Deciding on the skills to target based on direct observation and collaboration with parents and other practitioners, any assessments that have been completed, developmentally appropriate and meaningful areas (including core ASD characteristics) that may produce immediate a widespread positive changes, strengths and preferences or interests of the toddler, and family preferences/context. This step puts together individual PRT components to create a PRT learning opportunity. The steps for using PRT include selecting target behaviors and varying tasks and responses. Select your targets from the toddler’s individualized goals and objectives. Vary tasks. While following the toddler’s lead, parents and practitioners should vary tasks, materials, and activities to maintain their toddler’s interest and engagement. Mix up the activities and the tasks within activities. You should be alert to a toddler’s behavioral cues (e.g., lack of attention, attempts to change activities) that signal that they are becoming bored and that it is time to change to a new item or activity, or change the tasks and demands within an activity. It is best to vary the task before the toddler disengages, so that motivation can be sustained. Target response variation. If appropriate, mix up the skills. Varying the target responses helps maintain a toddler’s level of responding and initiating during learning interactions. Varying targeted responses also helps avoid “drilling” the toddler. If attempting to improve a toddler’s motivation to engage socially and learn, avoid drilling by varying the target responses. Again, be alert to a toddler’s behavioral cues that signal that they are becoming frustrated or bored and that it is time to vary the targeted responses. Mix up the instructional cues, prompts, and contexts. Increasing the variation in cues and prompts for a task, and other environmental conditions, also helps to link desired responses to a variety of antecedents and contexts that could be present in a toddler’s everyday environments. An example would be: teaching colors on a variety of child preferred stimuli during a variety of games in different rooms of the house. This increase in variation allows for the possibility of greater spontaneity and generalization beyond the initial learning situations and fosters the toddler’s responsiveness to a range of stimuli. You can maximize a toddler’s motivation during learning and interaction by mixing maintenance opportunities with acquisition opportunities. The acquisition trials involve tasks that are new or currently being learned and are often times more difficult trials than previously mastered items in maintenance trials. Identify skills that are easy for individual toddlers (i.e., maintenance tasks) and ones that are more difficult (i.e., acquisition tasks). Provide a mixture of easy and more difficult tasks so that toddlers can be successful at using a variety of skills. To facilitate maintenance of previously learned target skills and to build behavioral momentum for good trying on harder tasks, provide a few short requests that are easy and within the toddler’s current repertoire of mastered skills to complete followed by one or two requests that are slightly more difficult for the toddler to complete. A parent might ask a toddler to point to a familiar picture in a favorite book (a maintenance task), then ask them to identify a less familiar picture, or perhaps by asking what is happening in the picture. This is an acquisition task targeting verbs. By attending to a toddler’s behavioral cues that signal that adding maintenance tasks prior to the next acquisition task might help optimize the toddler’s motivation to learn and socially engage, the ratio of maintenance and acquisition tasks can be varied. The toddler's behavioral cues might include: lack of attention, avoidance responding, escape-driven challenging behavior, lack of trying, and indications of frustration. Following the toddler’s lead in order to identify child-preferred teaching materials or activities and natural reinforcers is an important component of establishing motivation in PRT. This step allows toddlers to choose play materials, toys, and activities that will be used in the PRT learning opportunity. Begin following the child's lead by observing when the toddler has free access to materials and activities to identify their preferences for items, activities, and toys. Entice the toddler with toys and activities and observe how they toddler responds in order to assess if, in that moment, they are interested in playing with the materials or engaging in the activity. If the toddler indicates interest in the moment, then the item or activity can be used within the PRT learning opportunity. A toddler might indicate interest by reaching for the materials, begining and playing with the materials, or by smiling and giviing eye contact during the social activity. A teacher notices that a toddler plays with dinosaurs for most of free play. The teacher follows the toddler’s lead by going over and playing with the dinosaurs together. By following the toddler’s lead and combining it with shared control, the teacher could intersperse PRT learning opportunities as they play with the dinosaurs. Beginning learners, or younger toddlers, working on developing communicative intent could be prompted to vocalize “dino” or point to the “dino” in order to take a turn playing with the dinosaur. A more advanced learner, or older toddler, working on play skills such as block building could be prompted to build a tower together prior to letting a dinosaur knock over the tower. Identifying individualized, socially oriented reinforcers and embedding preferred social interaction within the delivery of natural reinforcement has been shown to improve social engagement and joint attention (Jones, Carr, & Feeley, 2006; Koegel, Vernon, & Koegel, 2009; Vernon, Koegel, Dauterman, & Stolen, 2012). Why embed social activity interests and preferences? These strategies may help increase social behaviors such as reciprocal social smiling, eye contact, social orientation toward a parent instead of toward an object, and joint attention. Some researchers suspect that early challenges in social motivation are core to the development of ASD (Dawson, Webb, & McPartland, 2005). PRT can be used to increase social motivation early in an infant or toddler’s development before secondary symptoms arise (Dawson, 2009; Voos et al., 2013). incorporate as activities more frequently in the child’s day. use as an idiosyncratic social reinforcer as a consequence for joint attention. It is important, especially for infants and young toddlers, that rewarding social activities comprise many of their PRT learning interactions. A rewarding social activity is an activity where another person, such as a parent, is a crucial component of the reward value associated with the activity. In other words, the reinforcer does not exist without the social engagement of the parent or practitioner with the toddler or infant. Follow the infant’s lead and identify a variety of social activities in which s/he will engage – even if briefly! Parents and practitioners may have to do some enticing and “try outs” of the different social activities in different contexts. Be persistent and look for even fleeting moments of eye contact and positive affect, such as brief smiles. Categorize the social routines according to neutral or preferred activities. Parents may have different levels of preferred activities, such as, “sometime preferred” versus “often preferred.” Parents can turn the list into a preference hierarchy of social activities. Begin with strengths! Start by incorporating the most preferred social activities in which the infant will usually engage. Spend 10 seconds on each preferred social activity before varying the task to the next activity. Do this for approximately 5 minutes or less. Start with smaller amounts of time and increase gradually. End each social activity on “a positive note,” when interest levels are still high. Do not wait until the infant or toddler has indicated lack of interest before varying the social activity. Within the next few times a parent provides these opportunities, they should attempt to introduce the next social activity on the hierarchy list and add it to the activity repertoire. Intersperse it among the preferred maintenance social activity. For instance, engage in the social activity the infant/toddler is most likely to happily engage in (maintenance), and then vary the task by introducing the neutral acquisition activity while they are still engaged. Make the acquisition social activity very brief at first. Reinforce the infant or toddler by quickly going back to the preferred maintenance social activity. Take a break after the designated amount of time for staying socially engaged in social activities (e.g., 5 minutes total). Remember, these simple social interactions could be taxing on an infant or young toddler. Try to choose social breaks, such as being carried around by an adult, but make sure it is a break! Gradually increase the duration of each social activity, the overall amount of time socially engaged (e.g., from 5 minutes to 7 minutes), as well as the number of social activities added to the infant or toddler’s preferred social activities. Incorporate into PRT opportunities at a later time. As the infant or toddler develops, embed the preferred social interactions into natural reinforcers for other PRT opportunities. For instance, as the infant or toddler begins to prefer the tickle activity, intersperse prompts to vocalize “tickle” and naturally reinforce attempts by tickling the infant or toddler. See Natural Reinforcers, for more on embedding social activities in natural reinforcers and using individualized social reinforcers. A mom observes that her 9-month-old rarely socially smiles, however sometimes likes being held and walked around, having her toes nibbled, and having her stomach blown. Her infant, though, will only play peek-a-boo for very fleeting moments and will almost never socially smile during the routine. Mom wants to increase her infant’s social engagement during this peek-a-boo activity. Mom begins the social play routines at a time she has found her infant to most likely respond with eye contact and smiles, which happens to be right after bath time. Mom quickly varies between nibbling on her toes and blowing her stomach, and after a few minutes (before her daughter disengages), mom picks her up and walks around the room together. Mom continues this all week. After a few days her infant is consistently giving eye contact and socially smiling, and sometimes laughing during these brief social routines. Mom then decides to add peek-a-boo to the routine. After going through the maintenance social activities, mom begins playing peek-a-boo and as soon as her infant responds by looking at her with a smile, mom smiles back enthusiastically and goes back to blowing her stomach. A couple days later, mom mixes in two peek-a-boos because her daughter is spending more time happily and socially engaged during the ten seconds of peek-a-boo. This interaction becomes a part of their bath time routine. Soon her infant is anticipating the peek-a-boo game after her bath. Later in her child’s programming, when she is 13 months and highly prefers peek-a-boo, her mom prompts her to say, “boo,” in order to initiate playing peek-a-boo together. You may also incorporate a toddler’s interests into established or new activities, tasks, and routines. For instance, if the toddler has a perseverative or strong interest in dinosaurs, during the play dough center, the dinosaur cookie cutters could be used to motivate the toddler to play functionally with the play dough. A toddler working on receptive language skills and functional play could be told to either roll the play dough or pat down the play dough. Making dinosaurs with the dinosaur cookie cutters naturally reinforces the toddler’s attempts. During book time, books with dinosaurs could be read together and PRT opportunities could be interspersed during the engagement (e.g., asking the toddler, “What do you see?” and then naturally reinforcing them by turning the page to see more dinosaurs). A mom wants her older toddler to wash her hands, but often refuses and tantrums. Mom decides to incorporate her interests, including bubbles and letters. Mom fills up the sink and makes bubbles and puts plastic letters in the sink. As her toddler begins to accept going to the sink to wash her hands, mom gradually fades out the bubbles and letters. Arrange the toddler’s environment with child-preferred, developmentally appropriate objects and activities. During free time a parent could lay out an array of art materials for a toddler who enjoys arts and crafts. Incorporate choice-making opportunities into naturally occurring routines, activities, and task demands or instructions throughout the day. Choices enhance engagement, increase rates of learning, and decrease challenging behavior. Choices also provide outstanding communication and language development opportunities. Choices are also provided within adult-directed instructions, providing a level of shared control (see Shared Control) that improves a toddler’s response to adult direction. A variety of choices can be offered in terms of: what / which (what to do, which one to play), where (to do the task), with whom (to play), how (the action should be done), and when (to do the activity). During a transition away from a preferred activity such as trampoline, a practitioner could ask the toddler if she wants to run inside or walk to the swing, or if she wants to jump five more times or ten more times before going inside for snack. If it is time to work on fine motor skills and scribbling with crayons, the toddler could choose which color crayon or paper to use. Allow toddlers to select materials, topics, and toys during teaching activities. This may be particularly important when introducing new skills and tasks. Using toys, items, and activities that individual toddlers prefer may increase their motivation to participate and thus may increase the likelihood that they will rapidly acquire target skills and use them spontaneously. For example, when a toddler chooses to use colored Legos instead of wooden blocks, he may be more motivated to complete a tower building task during fine motor center. Restricted interests. Many children with ASD have restricted interests. Although expanding interests should be an important component of intervention, many skill areas targeted for toddlers with autism, such as communication, language, and socialization, will capitalize on the child’s current interests and preferences. This is particularly the case for toddlers just beginning to learn communicative intent and develop first words. If a toddler has a restricted interest in turning lights on and off, in the PRT model the toddler’s first word may be an approximation of the word “light” or “on” in order to gain access to turning on or off a light. However, as the toddler progresses, and in certain circumstances, a practitioner might work on expanding preferred play and functional activities and interests via PRT and related evidence-based strategies. Perseverative interests. Incorporating perseverative interests into PRT opportunities has been shown to increase initiated joint attention acts where children share their interests socially with the adult (Vismara & Lyons, 2007). For this reason, parents and practitioners incorporate perseverative interests in play and daily routines in which PRT is implemented. A toddler’s increased engagement in joint attention may be an important collateral effect – or indirect effect – of using this PRT strategy. In this study, incorporating perseverative interests specifically into PRT evoked initiated joint attention acts with clear social functions, such as to share affect and their interest with an adult (versus communicating with the adult via joint attention in order to obtain the item). For instance, if a two-year-old perseverates on numbers, then number puzzles and number books could be used when playing with the child. See the table provided above for ways to incorporate perseverative interests in order to improve social motivation and increase initiated joint attention. Creating shared control is an important step in establishing the toddler’s motivation to respond. Shared control also assists in obtaining the toddler’s attention. The concept of shared control generally has to do with both the adult and child playing important roles in the learning interaction. Shared control also helps to set up, or establish, a situation where natural reinforcers can be provided contingent on attempts at target behaviors (see Natural Reinforcers). Sometimes this is called briefly “restricting access” to a child chosen item or activity. Turn taking is a natural way to set up a contingency and provide appropriate models. Once parents and practitioners have established that the toddler is interested in engaging with a certain item or in a certain activity in the moment, then they are ready to set up shared control. By taking a turn, parents and practitioners are not only teaching the toddler turn taking, but also setting up an opportunity for another learning interaction, whereby the toddler is given another turn contingent on an attempted response (see Natural Reinforcers). Appropriate models (e.g., play actions and comments on play) are also provided on the parent or practitioner’s turn. Manage materials and "in-sight and out-of-reach"
Have child-preferred materials in a container or kept in-sight of the toddler, but out of their reach. The chosen materials are brought out one at a time and piece by piece. This allows for shared control of the materials. The adult controls the flow and delivery of the toddler chosen items and activities contingent on desired response attempts by the toddler. This environmental arrangement helps establish motivation throughout play or a daily routine. Parents and practitioners are good at knowing when a toddler needs assistance and may complete the assistance without expecting a response from the toddler. Instead, in PRT they create shared control and use these times as learning opportunities! Interrupt a routine and complete the routine contingent on a desired response by the toddler is another way to establish motivation through shared control. Instead of the toddler having full control over the routine, a practitioner and toddler share control of it. If possible, interruption should be natural and playful, versus abrupt and overly contrived. Shared control learning interactions also involves providing choices in activities and tasks. For instance, although at first the toddler’s interests will be followed, they will likely be followed within appropriate boundaries set by the parent of practitioner. As seen in prior examples, the parent or practitioner also chooses what responses are expected of the toddler during PRT learning opportunities. Further, as an older toddler progresses, it may be the case that the parent or practicioner and the toddler take turns in choosing among preferred and neutral activities. Within a given task demand, there also may be shared control over which parts of the task or routine will be completed by the toddler versus the parent or practitioner, or how the task will be completed. Parents and practitioners should establish the toddler’s attention before providing cues, prompts, questions, instructions, and/or choices (see Prompting Strategies). Strategies for gaining attention include: saying the toddler’s name, tapping on their shoulder, making an enthusiastic sound or phrase, giving a quick tickle, making eye contact, and/or arranging the environment to support shared control (see Shared Control). Strategies for gaining a toddler’s attention should also be varied over time. Some toddlers who are nonverbal may have difficulty orienting and attending to the relevant cues in the learning interaction, such as, a verbal model of a word. In this case, effective and individualized strategies for gaining child attention/orienting should be tried (Koegel, Shirotova, & Koegel, 2009). Using individualized orienting cues just prior to providing the verbal model prompt could improve the beginning learner’s response to the verbal model prompt, that is, imitation of the verbal model. A three-year-old nonverbal toddler who had difficulty developing first words, oriented to and imitated the verbal model immediately after being asked to give a high-five. High-fives were found to consistently produce an orienting response from the three-year-old. The researchers thought that the high-five functioned to orient the child to the relevant information: the adult’s verbal model of the word. Once the toddler is attending, parents and practitioners use brief and clear instructions. These instructional antecedents should mirror naturally occurring cues and prompts as much as possible. When a toddler indicates he wants to turn the water on at the sink, a parent or practitioner can teach the toddler to request to turn it on (when the toddler has not yet acquired the word “water”) by prompting the toddler simply with the verbal model, “water.” There is no need to prompt with, “Say water.” Likewise, saying a long phrase, such as, “Okay, Logan, just say water!” is not an appropriate instructional antecedent for teaching first words with PRT. The full model is used to prompt the child to respond with an imitation of the model. In order to increase rapid independence, partial prompts can be used to fade full models. Providing choices is another motivational procedure (see Step 2.2 for more on choices) and is an important prompting strategy. Choices contain two models for the toddler to choose between and can prompt the toddler to imitate one of them (and not the other) and/or engage in one of the response choices (and not the other). Careful and systematic teaching of choices is also useful for reducing immediate echolalia and indiscriminate choice making (e.g., the toddler simply repeats the last part of the choice). See Koegel and Lazebnik (2004, pp. 56 - 59) for simple solutions for reducing immediate echolalia and increasing accurate choice making in verbal children with autism. Balancing prompts. Prompts that provide more assistance are tools for successfully teaching new responses. Prompts should be faded into prompts that provide less assistance in order to increase a toddler’s spontaneity, initiations, and independence. Prompting should be fairly balanced in terms of providing assistance to teach new responses while maintaining opportunities for the toddler to be spontaneous and use mastered responses independently. Carrier phrases. Toddlers, who are first learning to talk, may also benefit from “carrier phrases.” Common carrier phrases include, “ready, set… go!” or “one, two… three!” where after the third listed word a natural reinforcer follows. Once the toddler becomes familiar with the carrier phrase routine, a time delay can be inserted after the second word in the phrase in order to evoke a communicative attempt by the toddler (e.g., “go!”). This strategy is an example of a high probability behavioral momentum sequence. Building complexity. Parents and practitioner provide increasingly lengthy and varied instructions, questions, models, and choices to toddlers with more advanced language skills, or who are in the process of developing more complexity. An appropriate level of clarity, however, should be maintained based on the toddler’s language level. For more information on effective prompting strategies, see the NPDC website and the ASD Toddler Prompting Learning Module. a) Reinforce the toddler's attempts at responding that are clear, unambiguous, and goal-directed. Although this is not the targeted response, such as, “book”, the parent immediately reinforces the attempt by saying “book!” while handing the book to the toddler. Doing so naturally reinforces the attempted vocalization and re-models (recasts) the target response. Provide direct reinforcement immediately after and contingent on a goal-directed attempt. Pay careful attention to providing reinforcement only after a correct response or attempt by the toddler. A practitioner immediately continues tickles (the natural reinforcement) for an infant who attempts social engagement by giving brief eye contact and socially smiling. A natural reinforcer is defined as a reinforcer that has a direct relationship to the child’s behavior and the task. The reinforcer, a consequence, is logically related to a chain of antecedents and responses. A toddler may indicate interest in blowing bubbles. When he blows the bubbles, the bubbles created are the natural reinforcer for this behavior (i.e., blowing the bubbles). Likewise, if the toddler requests the bubbles to be blown by vocalizing, ”bah,” the natural reinforcer would be for the parent to open the bubbles and blow them (or help the child blow them). This is done in conjunction with following the toddler’s lead, providing choices, and establishing motivation through shared control. The delivery of the natural reinforcer is directly tied to these PRT components. For example, a parent or practitioner presents a child with a clear jar with a lid that contains raisins. The toddler will most likely try to open the jar and then look to the practitioner for help. After the toddler attempts to use a target phrase either independently or through clear prompting, such as “help!” or “open raisins", the practitioner immediately provides access to the natural reinforcer inside the jar. In contrast to PRT opportunities that employ natural reinforcers, the parent could have prompted the toddler to say “open” in reference to an empty jar, then provide a raisin sitting on a plate on the table. If a toddler’s target behavior is to ask for a break instead of escaping demands by screaming, when the toddler initiates a request for a break by saying, “break” or pointing to a “break card,” the practitioner immediately responds by allowing the toddler to have a minute of neutral free time while staying in the same area. However, if the teacher instructed the toddler to complete another task before reinforcing her initiated response, “break,” then this would not be an example of a directly related, functional reinforcer. Note: Although not a natural reinforcer, this would be an appropriate strategy for thinning reinforcement in order to increase desired task engagement over time. Follow the infant and toddler’s lead in order to identify reinforcing social activities that can be increasingly incorporated into routines for infants and toddlers. Research has also identified that embedding preferred social activity into the delivery of the reinforcer is effective in improving synchronous toddler and parent engagement, eye contact, and improved toddler and parent affect (Vernon et al., 2012). Joint attention is a triadic social experience between a child, item or event, and an adult. Infants as young as 8-months old engage in joint attention in order to share with parents their affect (interest, happiness, enthusiasm) associated with an event or item. The natural reinforcers for joint attention acts should be distinct from the natural reinforcers associated with requesting items and events, as well as other behavior regulation functions (Jones, Carr, & Feeley, 2006). Provide the enjoyable social reinforcers right after joint attention, such as pointing at a picture or saying a comment. They are social because the rewarding aspect of the activity centers around interaction with the adult. Review examples below of potential ways to use social reinforcers when directly targeting joint attention in infants and toddlers. In the examples, the toddler’s social reinforcers include tickles, exaggerated noises or voices, and jumping with an adult. Toddler finds the letter “V,” picks it up, holds it out to show Dad, and smiles at him. Toddlers with ASD can successfully be motivated and taught to ask a variety of Wh- questions (Koegel, Bradshaw, Ashbaugh, & Koegel, 2013). Question asking is particularly relevant to initiations because it shifts the initiation of the learning interaction from the adult to the child. Often times, adults ask all the questions and start most of the learning interactions. By asking questions independently, toddlers initiate interactions that facilitate information gathering and further learning. Teaching question asking also expands the purposes for which children might use communication. The questions described in this section are in developmental sequence. “What’s that?” is one the earliest developing questions and can be targeted for verbal children, with limited vocabulary, between the ages of 12 and 24 months. Place highly preferred items in an opaque bag (child choice and shared control). Prompt the toddler to ask, “What’s that?” or simply, “That/Dat?” for very young toddlers. Pointing at the object, in conjunction with asking the question, should be modeled as the toddler learns to ask the question. Parents and practitioners should also model proper question asking intonation and additional gestures (e.g., shrugging shoulders) during these opportunities. Show the toddler what is inside the bag, provide the answer (i.e., a verbal model of the item’s label), and then give them immediate access to the item (natural reinforcer). In other words, initially the toddler does not have to make an additional request for the item. As the toddler learns to ask the question, practitioners may prompt the toddler to repeat the label prior to obtaining it. This additional step facilitates vocabulary development and teaches the difference between asking questions to obtain information and requesting to obtain an item. Obtaining information becomes a secondary reinforcer and a better approximation of the immediate natural reinforcer for asking questions. Gradually replace preferred items in the bag with neutral and unfamiliar items (e.g., a blank notebook, one wooden block, a fork). Gradually fade the use of the opaque bag when toddlers consistently and spontaneously ask the question, “What’s that?” or “That/Dat?” All prompts are also faded. Remember, it is important that the toddler ask the questions independently. An index finger point toward the bag and items could also be modeled and prompted as the toddler progresses so that the toddler points in conjunction with asking the question. Encourage generalization by placing items in other opaque objects or locations (e.g., boxes, in hands, behind back). During a preferred activity with multiple pieces, collect the pieces and hide them nearby without the toddler seeing. If the item is desired or needed during the activity, this will establish the toddler’s motivation to ask a “Where?” question (shared control and following the toddler’s lead). This can also be done by gathering a variety of highly preferred objects and playing a “hide and seek” game in a similar fashion. Once the toddler’s motivation to find the item has been established, prompt the toddler to ask “Where?” or “Where’s [item]?” (depending on the toddler’s language level). Immediately tell the toddler where it is by emphasizing the preposition (e.g., “under the bridge”). If nearby, initially point or gesture to where the item is hidden (as the parent answers verbally). Or if the item is a bit further away, immediately run the toddler over to where it is and let them take the item (natural reinforcer). As the toddler learns these prepositions, fade prompts and simply tell the toddler where the item is so that they may go obtain it. It is important that parents and practitioners not just go get the item and hand it to the toddler. This is because ultimately toddlers should distinguish basic requests from requests for information. Obtaining location/positional information (of desired items) is the goal and best approximation of the natural reinforcer for asking where questions. As the toddler progresses, prompt him/her to repeat the answer, or ask him/her the where question as a follow-up question, so that the toddler may acquire the prepositional phrases. In this way, the toddler is simultaneously efficiently learning to ask where questions, to answer where questions, and to understand and use prepositions. As the toddler progresses, fade all prompts and focus on using time delays or indirect prompts. For instance, parents and practitioners may wait three seconds before prompting the toddler to ask the question, or say that “[name] knows where it is,” or say “it’s not in here…,” as additional ways to indirectly prompt the toddler to ask the question. When the toddler begins to spontaneously initiate “Where?”, try to immediately reinforce the toddler with the information and access to the item as continuously as possible. The reinforcement schedule is thinned as the children initiate more consistently. Facilitate generalization by prompting and reinforcing “Where?” questions in multiple settings, with multiple types of stimuli, and with multiple people throughout the daily routine. Gather a variety of the toddler’s favorite items (child choice). Before the toddler can take an item, prompt the toddler to ask, “Whose?” or “Whose is it?” (depending on language level). Immediately answer, “Yours!” and allow the toddler to take the item (natural reinforcer). As the toddler spontaneously asks, “Whose?”, target pronoun reversals by prompting the toddler to say, “Mine!” after telling her/him “Yours!” This reinforces the toddler for making the correct pronoun reversal. Begin to intersperse neutral items and answer the toddler’s initiated “Whose?” question with the answer “Mine!” Because these items are neutral, the toddler will not mind if the adult takes it. Prompt the child to respond back with the pronoun reversal “Yours!” prior to bringing back out the more preferred items (natural reinforcer, turn taking). Target possessive endings, such as Mom’s, Suzy’s, or Grandpa’s, in the same manner and by using items that can be associated with each person. Fade prompting, use time delays, and target throughout the toddler’s day. D) asking: "What's happening?" and "What happened?" There are several ways to teach older toddlers and preschoolers how to ask more advanced questions. Select pop-up books that are related to the toddler’s interests (child choice). Prompt older toddlers and preschoolers to either ask, “What’s happening?” or “What happened?” after they pull the tab for the pop-up pictures. Once toddler ask the question, model the correct verb ending (“dog’s jumping” or “dog jumped”) and give toddlers a turn to pull the tab (natural reinforcer). As toddlers progress, repeat the verb phrases, or answer these questions as a follow-up question, in order to facilitate development of these morphemes or language skills. Fade prompting and use time delays. Follow the toddler’s lead and select videos that are related to the older toddler’s interests. Pause the video (creating shared control) and then prompt children to either ask, “What’s happening?” or “What happened?” during or after a clear action has occurred in the video while the toddler is attending. Once the toddler asks the question, model the correct verb ending (“dog’s jumping” or “dog jumped”) and then press play and/or re-watch the action in the video (natural reinforcer). As toddlers progress, repeat the verb phrases, or answer these questions as follow-up questions, in order to facilitate development of these morphemes or language skills. E) attention and social commenting: "Look!" Set up motivating situations where the toddler may try to obtain adult attention non-verbally. There are at least two types of situations where a toddler may want your attention. Either of these situations can be used in order to establish a toddler's motivation to initiate, “Look!” In either case, begin the learning opportunity by clearly turning away their attention briefly. Immediately and enthusiastically give the toddler attention. Follow by either: assisting the child with his/her request or providing attention and praise for the item or event being socially shared by the child (natural reinforcers). For toddlers initially developing interest in social comments, adding individualized social reinforcers (e.g., tickles, silly noises) to the natural reinforcement may also be helpful. For instance, if a parent prompts her toddler to comment on a train, “Look, train,” the parent can provide attention toward the train and make a “choo choo!” sound (if the child enjoys the sound), followed by playing together with a preferred train. Fade prompting, use time delays, and prompt and reinforce “look!” initiations throughout the toddler’s daily routines as soon as appropriate. Increase the complexity of the utterance and add point to toddler’s initiations: “Look, daddy!” or “Look, a train!” (while pointing to the train on TV) or “Look mommy, juice!” (while pointing at the refrigerator). Set up motivating situations where their toddler may try to obtain assistance nonverbally or may need help even though they may not seek assistance. For instance, if a toddler enjoys ring stackers, but needs assistance to put them on, a practitioner follows the toddler’s lead to the ring stacker and waits until s/he needs help. Once the toddler says “Help!” the parent of practitioner immediately and enthusiastically helps the toddler. For example, they put the ring on the stack together (natural reinforcer). As soon as appropriate, parents and practitioner fade full assistance into showing the toddler how to do it for him/herself. As soon as appropriate, parents and practitioners fade prompting, use time delays, and prompt and reinforce throughout the toddler’s daily routines. Increase complexity of the utterance and add pointing to the toddler’s initiations: “Help me, Greg!” or “Help with shape!” while pointing at the shapes, or “Need help!” while pointing at the refrigerator. Using PRT motivational opportunities, teach and motivate older toddlers and preschoolers with ASD to respond to multiple cues. Cues, also called properties or attributes, are taught incrementally until toddlers respond to more complex tasks. Teaching multiple cues may not be appropriate for younger toddlers and are associated with advancing language and conceptual skills. Identify multiple cues and gather materials with multiple cues. Parents and practitioners identify a variety of cues (properties or attributes) that are associated with the stimulus (e.g., toy) or activity and that can be used during a PRT learning opportunity. Add another cue. As the older toddler advances, parents and practitioners provide at least two cues (e.g., overemphasizing feature of object, color, size, type of object, location of object) so that their toddler will begin to use the target skill in response to more than one cue. Parents and practitioners also use different schedules of reinforcement to teach an older toddler with ASD to respond to multiple cues. Identify natural reinforcers. Numerous natural reinforcers that can be used to increase a toddler’s motivation to use the target skill of responding to multiple cues. For example, a practitioner might notice that the toddler enjoys playing games on the iPad, including a balloon popping game. Begin with fixed ratio, continuous schedule (i.e., FR1). Provide reinforcement for every attempt to use the target skill successfully (continuous schedule). As an example, a toddler is allowed to “pop a balloon” (natural reinforcer) on an iPad screen every time she answers what color or shape the balloon is. Progress to variable ratio, intermittent schedule (e.g., VR2). It is important to progress to intermittent reinforcement schedules throughout an older toddler’s PRT programming. In a continuous schedule of reinforcement, you would allow the toddler to pop the balloons on the iPad game every time she responds to a question about the color or shape of the balloons she wants to pop. With a variable ratio schedule of reinforcement, VR2, the toddler responds with good attempts for an average of 2 questions prior to popping the balloons in the game. Use PRT motivational opportunities to teach and motivate children with ASD to engage in appropriate behaviors that foster early developing self-regulation skills. Implement self-management differently for older children. Refer to the National Professional Development Center on ASD for more information on Self-Management. Below are strategies that are integral aspects of early PRT programs and designed to teach the toddler to regulate his/her behavior through appropriate communication rather than challenging behaviors. Parents and practitioners teach the toddler to terminate an activity and transition by prompting them to communicate, “all done” prior to leaving an activity or areas. This can replace challenging behavior related to frustration and boredom that results in the toddler escaping the task. Or it may replace a toddler’s fleeting engagement as they bounce around from one activity to another. When the toddler communicates “all done,” naturally reinforce the toddler by allowing them to leave the area/activity. As the toddler learns to communicate “all done,” parents and practitioners add a clean up component that is brief at first and then gradually more involved. Clean-up occurs prior to allowing the toddler to leave the child-chosen activity. When toddlers are happy to clean up, parents and practitioners target various skills during clean up and it may be the case that the toddler re-engages in the activity during clean up. Often this leads to increasing a toddler’s duration engaged in the same child-chosen activity. As the toddler progresses, toddlers learn to terminate the activity by initiating “all done,” cleaning up, and then initiating play with a new activity with an adult (e.g., “come play…!”), prior to engaging in the new child-chosen activity. Asking for a “break” is taught in a similar fashion, however breaks are limited to a brief termination in the activity followed by re-engagement in the same activity. Teaching children to request help can decrease challenging behaviors associated with frustration, avoidance of tasks, and escaping tasks. It is important to be careful of reinforcing challenging behavior by helping a toddler after they just engaged in a tantrum or similar challenging behavior. Prior to providing assistance, parents and practitioners prompt the toddler to communicate, “help,” using an appropriate mode of communication. This teaches the toddler to regulate his/her behavior through appropriate communication. PRT can be used to teach appropriate, functionally equivalent (but more efficient) communicative replacement behaviors. During PRT interactions, proactively replace challenging behavior by prompting and differentially reinforcing appropriate communication while placing challenging behavior on extinction (i.e., withdrawing the maintaining consequences when challenging behavior is exhibited. PRT components also serve as antecedent (preventative) procedures by maintaining a toddler’s motivation and making challenging behaviors less relevant or necessary to the toddler. This strategy relies on the adult correctly identifying the function of the challenging behavior, and so the parent or practitioner may need to take data through a functional behavior assessment (FBA). However, clear functions can be actively replaced in the moment across multiple situations. Teaching the toddler to communicate to get his/her needs met is an important early developing self-regulation skill that can be fostered in toddlers. Differentially reinforcing functional communication at a young age could play an important role in the prevention of more serious challenging behavior from developing later in childhood. Combining FCT with the motivational components of PRT is an effective way to decrease interfering challenging behavior and keep children happy and learning during intervention and interaction. Improve tolerance for delays to reinforcement. For functional communicative acts, it is also important to teacher older toddlers and more advanced learners to tolerate delays to reinforcement. The amount of time before receiving reinforcement for maintenance requests by the toddler can be gradually increased and the reinforcer can be provided contingent on appropriate waiting during the delay (e.g., absence of challenging behavior). Parents and practitioners introduce reinforcement schedule thinning by intermittently reinforcing maintenance behaviors. Note: There are many positive behavior supports that should be integrated into a toddler’s intervention as needed. Other important techniques for addressing challenging behaviors in toddlers might include systematic desensitization, various antecedent manipulations, differential reinforcement of other behavior, additional applications of differential reinforcement of alternative behavior, and instructions based on the Premack principle. Teaching toddlers to use a visual schedule or activity system is another way to foster early developing self-regulation skills. We recommend that you continue with the same Scenario setting throughout the module. Which of these represents a motivational opportunity for a nonverbal 17-month old toddler? A nonverbal child reaches for the light switch to turn on and off the light. A practitioner stops the child and redirects the child to vocalize for a ball he is holding. The child does not respond or attempt to obtain the ball and instead goes back over to the light and turns it off. When a mom sees her nonverbal child playing with a ball ramp game, she puts down the book she was going to read to him and goes over to the ball ramp toy. Mom repeatedly says the word “ball” while trying to get her son’s attention as her son continues to put the balls down the ramp. A practitioner selects multiple flashcards of items she knows the three-year-old toddler prefers. She sits with her on the carpet in the playroom (the natural environment) and then provides ten trials in a row asking the child, “What’s this?” for each card. The child gets to briefly play with either a squishy ball or spin toy (determined through a brief reinforcer assessment) for correct responses. What are some potential collateral effects of self-initiations? Which intervention uses an appropriate natural reinforcer for teaching question-asking? The correct answer for the intervention that uses an approprate natural reinforcer for teaching question-asking is 3. When the toddler asks where an item is, you tell the toddler the location of the item and assist/prompt to make sure they can obtain the item from the location quickly. An older toddler enjoys playing with wooden puzzles. Which of these examples of learning materials provide an ideal situation for teaching multiple cues? The correct answer for an example of learning materials that provide an ideal situation for teaching multiple cues is 3. A puzzle with one blue square, one red square, one blue circle, and one red circle . Teaching multiple cues is a beginning level PRT intervention target for nonverbal toddlers with autism. Teaching multiple cues may not be appropriate for younger toddlers and are associated with advancing language and conceptual skills. Review Step 2.9 for more information. Monitoring progress of PRT is done by selecting appropriate data to collect and using the data to make decisions. This step also involves collecting and analyzing on-going data on a toddler’s behavior during intervention for each meaningful objective. objective and for the toddler’s overall progress. As much as possible, the difference between baseline and intervention data should be the effect of the intervention. Otherwise, parents and practitioners may be less confident about whether the intervention was actually effective. Progress monitoring will result in either proceeding with the next goal of a successful intervention, or making a modification to a less successful intervention. If the intervention is implemented with low fidelity, that is, not as the intervention was intended, modifications or re-training are implemented. the feasibility associated with collecting the different types of data. Typical types of data include: frequency or event-recording (e.g., rate and percent occurrence/correct), partial and whole interval, duration, and latency recording. However, there are some additional considerations specific to PRT. Data collected from language samples during play and daily routines can easily be converted into a variety of behavior data. See Planning PRT for a more in-depth look at communication samples and the types of data that can be extracted. PRT may make more frequent use of language or communication samples. Data are collected within everyday environments, rather than special purpose assessment contexts. Monitor whether settings and antecedents are being varied. Given that initiated, spontaneous, and generalized behaviors are key in PRT, it is important to track the varied types of prompts and instructions provided, as well as the varied settings and learning situations. These data on instructional variation assess the association between parent or practitioner instructional behaviors and child behavior and progress. Are parents and practitioners providing enough opportunities for spontaneous or initiated child behavior, or instead are they directly initiating most of the interactions through model prompts, choices, and questions? If most of the opportunities were model prompts, this might explain lower levels of a toddler’s spontaneous use of target behaviors. Are the acquired skills generalizing to diverse situations and are diverse situations being provided? Answering “no” suggests the need to consider teaching with more diverse stimuli, with additional people, and in multiple contexts. Can the toddler appropriately respond to a variety of relevant antecedents and are you varying stimuli and tasks, such as cues and questions, at appropriate levels? If the toddler cannot respond appropriately, you will need to improve the implementation of PRT. 4. Vary target behaviors in trial-by-trial (opportunity-by-opportunity) data. When collecting percent correct through trial-by-trial data recording, do not provide too many of the same trial or opportunity consecutively. When collecting data on toddler performance during 10 total opportunities, those 10 opportunities are rarely provided all in a row. Avoid “drilling” target behaviors. Data collection systems can support this by providing data recording options for multiple objectives on a single form. 5. Individualize how and when data are collected. This helps data to be as easy as possible to collect. For instance, one mother who was working on question asking with her son started with having her toddler ask where his shoes were before going outside (to preferred activities). In order to make data collection easier, his mom placed an index card on a table by the doors to outside. Mom also appreciated that the card acted as a cue – to remind her to provide the opportunity! Some families put data sheets/cards/post-its on the refrigerator or in the car. A more tech savvy parent might want to set up a free note application on their smart phone to collect data, because it is easy to carry around, they might usually have it with them, and they enjoy technology. Another parent might keep a data sheet by the toddler’s bed, because they are working on teaching their toddler to answer a variety of questions as they read books before bed. 6. Collect representative data probes instead of constant data on every PRT learning opportunity. Data collection is important for monitoring progress, but it may not be necessary to take data on every opportunity provided. A practitioner might choose one or two days a week to collect data across multiple objectives or for certain objectives. You may choose to take data on one objective for a day, however, data collection should be frequent enough to be representative and allow for modifying the intervention in a timely manner, if needed (Koegel & Koegel, 2012). An implementation checklist is provided in Module Resources so that parents and practitioners can evaluate whether or not PRT is being implemented as intended. Incorrect implementation could possibly account for a less successful intervention outcome. Before modifying the intervention, parents or practitioners may first attempt to improve fidelity of implementation and understand why it may be difficult to implement. How could you monitor a toddler's motivation during interaction and learning opportunities? A high percentage of responding indicates that toddler is motivated to learn and interact. Use a Likert scale, such as the one in the Likert Scale to Monitor Toddler Affect and Plan PRT. If a toddler is frequently initiating interactions and learning opportunities, this could indicate that the toddler is motivated to learn and interact. Please take a moment to provide valuable feedback for this learning module. Use the "Take the Module Evaluation Survey" link below to begin the evaulation.